We love Christmas! Add in a 1938 Heritage General Store and you create a magical Christmas Emporium! The store unveiled in full holiday splendor with great new Christmas decorations, gifts, home décor and scrapbooking that have been arriving just in time for Christmas shopping! So many new products including Manitoba made makers and there is so much to discover! Enjoy a latte, shop and hum to Christmas carols. A truly relaxing retail experience during this normal hustle and bustle season. How many trees can you count? A 1939 heritage general store is completely transformed into a magical Christmas store each year! 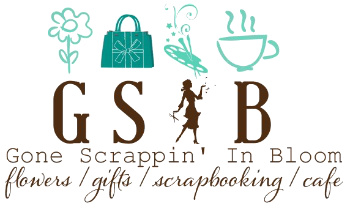 Welcome to Gone Scrappin' In Bloom offering fresh flowers, scrapbooking supplies, gifts, Manitoba made items, home decor and specialty cafe in Rossburn, Manitoba. Definitely worth the road trip! Christmas Magic Unfolds in Rossburn! Each year we completely flip the store for Christmas. If you can believe we fit 9 - 13 trees each holiday season. It becomes a complete Christmas store trimmed in glitter and magic. A heritage general store filled with treasures for all ages. Santa & Mrs. Claus even make appearances throughout the holiday season. Our annual Holiday Open House always kicks off around Remembrance Day. We have a Bloomin' Members only party and a week long Open House with Home Routes Concert, Santa Photos, Hot Chocolate Bar and more!